The St. Johns County School District (SJCSD) is committed to providing a safe and secure environment for your child. 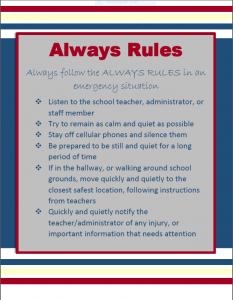 Each St. Johns County school has an Emergency Operations Plan with incident specific procedures that is reviewed and practiced regularly. These plans have been formulated using Federal Emergency Operations Agency and Department of Education guidelines that conform to federal, state and local guidelines. They have been coordinated with St. Johns County Emergency Services including law enforcement, fire and rescue, and the Emergency Operations Center. All principals are linked to the District’s Crisis Management Team through telephone landlines, cellular phones and/or two way radios. SJCSD recognizes The Incident Command System (ICS), a nationally recognized organization structure that provides for role assignment and decision-making while planning for and responding to critical incidents of all types. Our school district works closely with local public safety officials using their expertise and input. Regular safety, health, security and fire inspections take place each year in all district schools. All district schools have been designated as shelters to be used in the event of a hurricane or other emergency requiring temporary shelter. Each school has a Safety Committee that meets a minimum of four times per year to discuss issues of safety and security. Fire drills are conducted each month beginning with two occurring in the first 20 days of school and one each month after. We also practice tornado, Active Shooter and AED Response Drills for all faculty/staff and students as well as procedures used for bomb threats and shelter-in-place drills. Bus evacuation drills are held once each semester. Visitor and volunteer sign in procedures are required in each school. All district schools use the Keep N Track sign in system. We require all visitors and volunteers to sign in and wear name tags when visiting the school. All volunteers must complete a SJCSD Volunteer Application. A background check will be completed by the St. Johns County Sheriff’s Office for security approval before applicants can volunteer. All possible steps being taken to see to the safety of your children. Every school has specific plans for the reunification of parents and their children in the event of a major emergency. 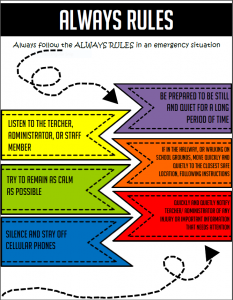 If an evacuation occurs, parents will receive communication with regard to the reunification location and process. To communicate with parents in a crisis, our mass communication system, SchoolMessenger, will be used. This system provides instant telephone, text and email communication accepting up to four phone numbers and two email addresses per student. In order to receive text messages you must opt in. Please visit http://www.stjohns.k12.fl.us/schoolmessenger/ for instructions. Our system can be used for emergency calls, community outreach, special events, and other school/district messages. School psychologists, social workers, and counselors trained in crisis intervention are available to students and their families in all emergencies. A district counseling team is also available for school support. All high schools, middle and elementary schools are equipped with AEDs (Automated External Defibrillator). Each school has CPR/AED certified faculty and staff and an AED Response team.